The faces, various parts, and inner surfaces of the bands sport attractive accent colors. 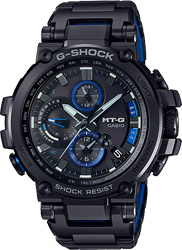 The case and band of the all black ion-plated model has metallic blue accents. Connected Engine supports time correction using a time calibration signal and Bluetooth® connection. 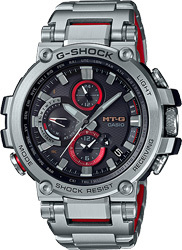 A Bluetooth® communication function makes it possible to connect with a smartphone running the G-SHOCK Connected* app and obtain accurate time information from an on-line time server. MULTIBAND 6 automatically adjusts time settings based on reception of one of six time calibration signals around the globe for automatic time adjustment when you are within the range of a signal, even if connection with a smartphone is not possible for some reason. All of this means that timekeeping is accurate, no matter where in the world you happen to be. 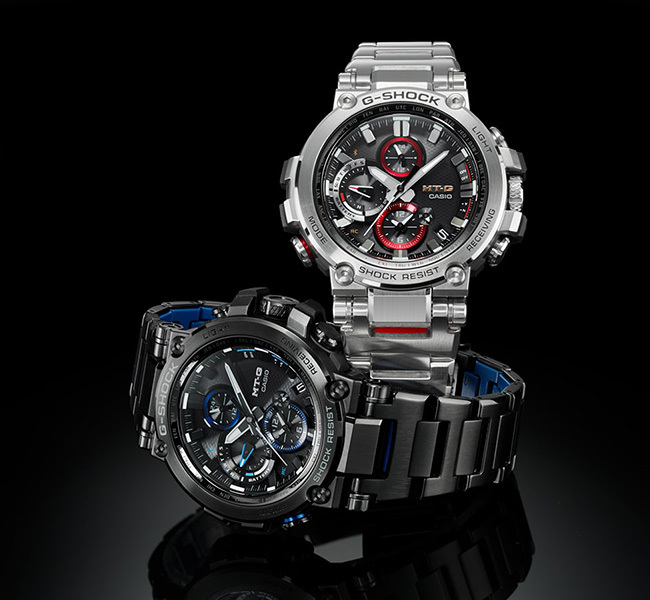 These new MT-G models combine metal and resin in a way that creates an innovative shock-resistant structure and a work of timepiece beauty, which houses a new module that ensures timekeeping is always accurate. 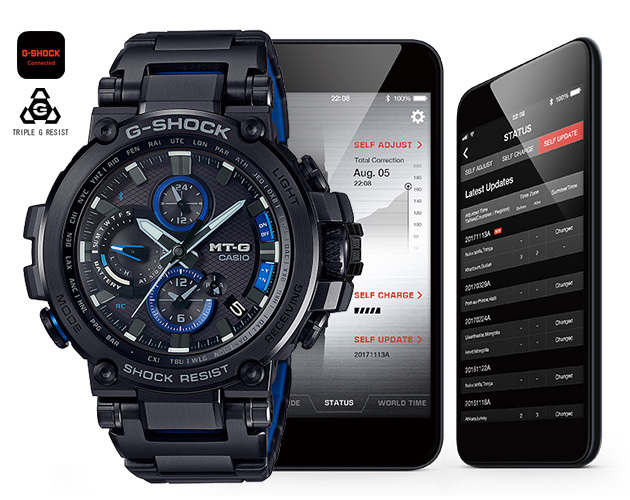 * Smartphone app for use with G-SHOCK Smartphone Link models. It establishes a Bluetooth connection with the watch's Connected Engine for automatic time correction, configuration of World Time and other settings, and more. It also makes it possible to keep updated with the latest time zone and summer time information. A Tough Solar power system generates enough energy to ensure uninterrupted operation of power-hungry functions.